Leopards occur in relatively large numbers on commercial and communal farmlands, where hundreds are killed annually for periodically taking livestock. To resolve the conflict between leopards and humans on farmlands and retain viable populations of these animals outside of conservation areas, the AfriCat Foundation is currently conducting a study of the home ranges and density of leopards on commercial farmlands in Namibia. Lise Hanssen, Director of the Foundation, filed the following report. Leopards are found throughout Namibia with the exception of the Skeleton Coast. They appear to be abundant on commercial and communal farmland, where they occasionally take livestock. For this reason they are actively persecuted through trapping, shooting and poisoning, and hundreds are killed annually. 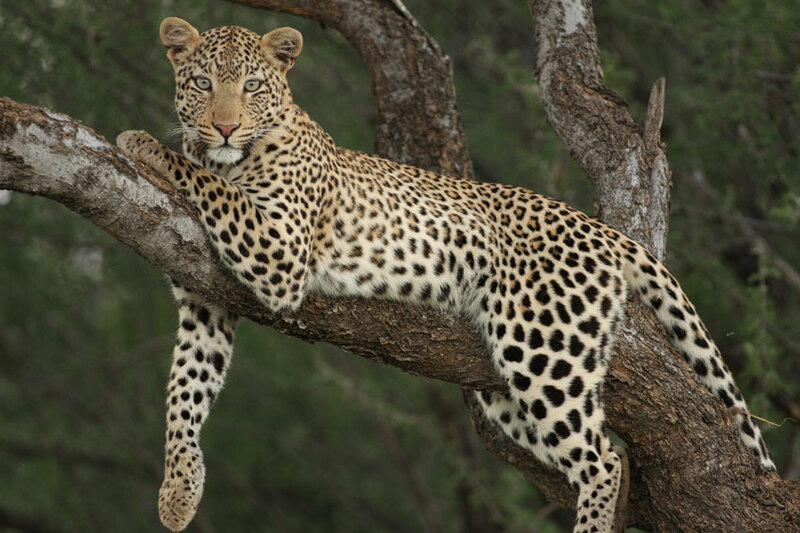 With the growth in human populations and changing land-use practices, it is becoming essential to resolve the conflict between leopards and humans in order to ensure the survival of these cats and other wildlife outside conservation areas. However, management strategies can only be formulated once the leopards are clearly understood. Although they are the most abundant of the large carnivores in Namibia, they are also the most secretive and often occur in remote areas where the terrain is rough. To date two attempts have been made to study this elusive animal, providing useful insight into leopard behaviour and ecology. In 1998, Dr Philip (Flip) Stander of the Ministry of Environment and Tourism (MET) and the AfriCat Foundation collaborated for the first time to obtain baseline data on leopards found on commercial farmlands in Namibia. Combining resources such as vehicles, aircraft and radio telemetry equipment enabled both parties to conduct vital research at a fraction of the cost. Okonjima Farm, the headquarters of the AfriCat Foundation and situated near Otjiwarongo in northern Namibia, was chosen as the study site. The farm extends across the Omboroko mountain range, is characterised by red Etjo sandstone, and lies at an altitude of 1700 metres. All the leopards using a demarcated area of 100 km2 needed to be captured and radio-collared in order to determine the population density and the home range size of individuals. The leopards were baited using cow heads obtained from the abattoir. These were attached to trees on the main thoroughfares used by leopard and were checked daily for any sign of leopard activity. Initially our attempts appeared futile, but before long leopard spoor became visible at the baits. Trapping leopards takes a reasonable amount of skills, as long-standing persecution has made them extremely wary. Box traps (cage traps) were set up at the baiting areas, but had to be disguised as tunnels through the vegetation. Throughout the trapping exercise, animals such as honey badgers, caracals, warthogs and brown hyaenas were also captured. The brown hyaenas were either ear-tagged or radio collared, and the others promptly released. Within four days we trapped and darted our first leopard. He was a young male of approximately two-and-a-half years old, weighing a hefty 61 kg. Blood samples were taken to check for viral antibodies and the radio collar was put on. We named him Pp1 (Panthera pardus the first). Within one month we had trapped Pp2, a five-year-old male, Pp3, a two-and-a-half-year-old lactating female and Pp4, a monstrous 69 kg, six-year-old male. Tracking was done by vehicle and on foot, and once every two weeks, Flip tracked with the Maule 5, the MET aircraft. 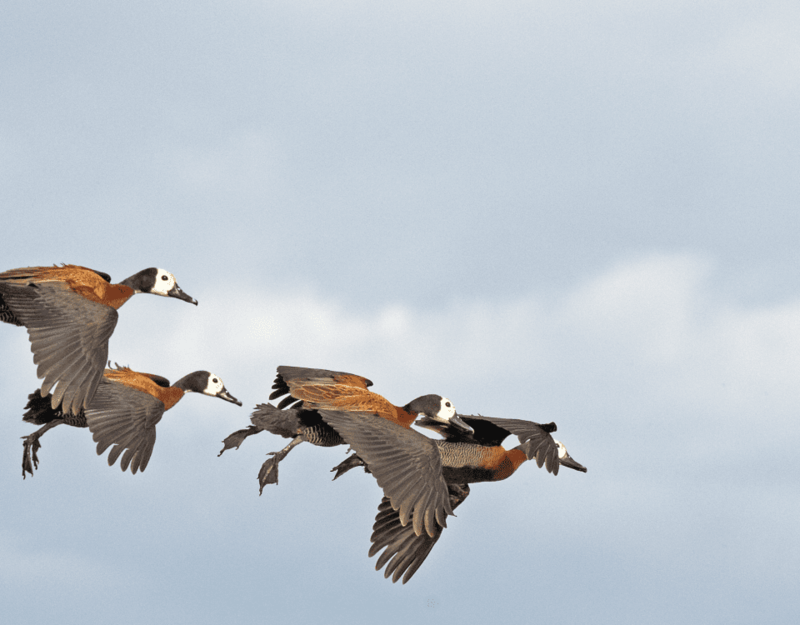 Aerial tracking is a lot faster, although far costlier than ground tracking. We were surprised how easy the leopards were to locate. Pp3 was regularly found in the same area, but we assumed it was because she had a cub or cubs. We were tempted to investigate the area but desisted, in case she did not take too kindly to this. Four months later a mortality signal was picked up from Pp4’s radio collar. A mortality signal is double the speed of the usual signal and is only emitted by the collar if the animal has not moved for eight hours or more. Vultures were seen from the aircraft and a GPS (Global Positioning System) location was taken. Following the GPS location on the ground led us to a cattle farm adjacent to the study area. The battered radio collar was found lying in the sand next to the remains of Pp4. All that was left were a few bones, his skull and some dry skin. The rest had been torn apart by jackals and vultures. There was no indication of the cause of the death. We called the farmer on whose land he had been found, learning that the farmer had not put out poison or shot any leopard on his land. We took Pp4’s skull and radio collar back to base, the latter for use on another leopard. Baiting and trapping resumed, and over the next three months we tracked and collared the remaining leopards. Pp5 was a young two-year-old male weighing only 40 kg. Pp6 and Pp7, both males, were soon trapped and collared. A set of female leopard spoor that did not belong to Pp3, the lactating female, appeared on the extreme south-west side of the study area, indicating another leopard yet to be caught. Our research revealed some remarkable information. The leopards clung to the mountains, with safety appearing to be an important factor in their home range sizes. Pp4 was an example of what could happen to a leopard if it ventured out of the mountains. Eighteen months after the start of the leopard study we trapped Pp12, the elusive female whose spoor had been seen in the extreme south-west of the study site. She was radio-collared and released back into her home range. Since no new leopard spoor were seen, we came to the conclusion that we had caught all the leopards in the study site. This was important to determine the true density of leopards in the area. No cubs were caught, so we assumed that Pp3’s cubs had not survived. Tracking by road involves travelling to the high points in the study site and locating as many leopards as possible. The location must be confirmed by triangulation, meaning the located leopards had to be located from two additional areas. A GPS position and compass bearing of the direction of the signal are taken of the point from where we were locating. This information is plotted on a map, and where the three lines drawn from the triangulation points meet is the precise location of the leopard. Aerial tracking is far easier. We fly high and scan all the collar frequencies. When we hear a collar signal, we look onto it and decrease altitude. The antennae mounted on the struts of each wing are connected to a switch box inside the aircraft, where the signal is loudest. When they are equal, you know the leopard is either ahead or directly below the aircraft. The closer the aircraft to the leopard, the louder the signal. When the signal is at its loudest we take a GPS reading, which indicates the position of the leopard. This information is also plotted on a map. On only one occasion was a leopard seen from the air, when Pp4 was spotted running for cover in the open veld a week before he died. Because Etjo sandstone is bright red and orange in colour, leopards tend to blend in, making sightings exceptionally difficult. Pp1 was seen while tracking from the ground. On one occasion his signal was so close that we couldn’t establish a specific direction. By searching the area with binoculars, we found him lying on a ledge about 20 m up a koppie. He appeared relaxed and was half hidden behind a tree. The following day he was heard sawing (a typical sound made by leopards) about 300 m from his previous location. As he had not moved very far between locations, we assumed that he might have made a kill. A search of the area after he left revealed the remains of a warthog. Leopards are quick to sense when the area is safe, and Pp6 has become quite habituated. We have seen him from vehicles a number of times. When leopards are located in the same area for more than a day at a time, they have often made a kill close by. In our study the kill sites were so inaccessible that we were not always able to examine the area. Information on kills was further limited by our poor tracking skills and because we often only found kills by smelling the carcass or seeing drag marks on sandy roads. With the exception of the warthog carcass, all the kills we found were kudu calves between 8 and 12 months old. We were not able to obtain data on smaller prey species such as hare and steenbok, but assume that they were regularly taken. The most interesting of all was home range information. Some leopard studies reveal a slight overlap or even exclusive home ranges. Our leopards appeared to be extremely tolerant of each other. Their home ranges vary between 6 000 ha and 30 000 ha. Although there was limited overlap between some of the study animals, others live almost on top of each other. Pp3’s area entirely encompasses Pp1’s, and both overlap extensively with Pp2. Pp6, the young male, overlapped with all leopards in the study site and has the largest home range of all. On one occasion he made a foray to the Omatako mountains about 30 km away, returning two days later. Although the majority of the leopards prefer the mountains, Pp6 and Pp7 were often located in the plains. Home ranges are determined by food availability and it appears that safely plays an important role in this particular study. Our study shows that Pp7 has moved into the area that Pp4 once occupied. This demonstrates that removal of leopard by farmers does not result in a leopard-free area. There is always a migrant looking for a suitable place to move into. After almost two years into the study, the leopards were becoming predictable. We knew more or less where they could be found, which saved time in tracking. However, in February 2000, Pp5 disappeared. We realised that one can never take a leopard’s behaviour for granted. We subsequently found out that he had been shot by a trophy hunter three farms away from the study site. Although trophy hunting is an accepted form of animal utilisation in Namibia, it was a shock to us, as the leopard population had been stable for so long. While we have finished the most intensive research, low-key monitoring of the radio-collared animals will continue. During the intensive period of almost two years, seven leopards – two females and five males – used the study site. This could change over time, because animal populations are dynamic. When, after three years, the battery life of the collar is reached, the animal will be retrapped and the collar replaced. This will give us long-term data on longevity and mortality. When animals die, trapping will resume for their replacements to be collared and monitored. Obtaining data such as density, home-range size, population structure and mortality contributes substantially to management guidelines for leopards in a largely farming community. In our opinion leopard studies in other areas of Namibia would paint an entirely different picture of these secretive cats. We hope that this study will contribute to a greater understanding of leopards on commercial farmlands and promote the conservation of this magnificent species for future generations. This article appeared in the 2001 edition of Conservation and the Environment in Namibia. Really interesting and helpful information. I have for a long time been interested in these creatures .